In this warped retelling of Eric Carle’s childhood classic, a loathsome, very hungry caterpillar fails to metamorphose as no cocoon will stretch around his bulging belly. Instead of becoming a handsome butterfly, the Caterpillar King (Nathan Charles) is a raging tyrant with a hunger for raw red meat. When the king meets his match in a beautiful butterfly queen (Ted Vaudrey) from an alternate universe, the servile Steve (Murray Burgess) – or is it Simon? – nervously suggests the king share his food with his kingdom. Will the king impress the queen and secure the long-term relationship he desires? From the first rhyme spoken in unison, The Very Well-Fed Caterpillar is high energy and high speed. Movement sequences are slick and well-rehearsed to match crafty writing which introduces the setting and tone of the piece concisely. The pace gives an impactful start, but it does turn out to be a detriment as gags are missed throughout the play. With such an abundance of quickfire jokes the enunciation of all the actors could be improved. Aside from this and a few dad jokes that fall flat, the play is laugh-a-minute with popular references to Shrek and Star Wars, and a spot-on impression of Gordon Ramsay in Hell’s Kitchen. You could definitely get more from this show with a second watch. The world Red Biscuit Theatre create is bonkers but relatable, featuring some tense group work and a passive aggressive exchange over the decision to name a character Neil. Theo Moore and Craig Unadkat are particularly funny multi-rolling as doors, a bell tower and conflicting members of the Cape Caterpillar Liberation Club. Human props play a large part in the story, used nicely both to transform the blank stage and as an illusion that can be deconstructed for comic relief. In such an absurd story, the cast quite literally lose the plot, but the diversions are welcome, leaving the audience in hysterics. The hour of silliness is definitely enjoyed by the cast and audience alike, which is a thrill to see. Most impressive is how the company deliver a moral message of redemption amidst their twisted tale. 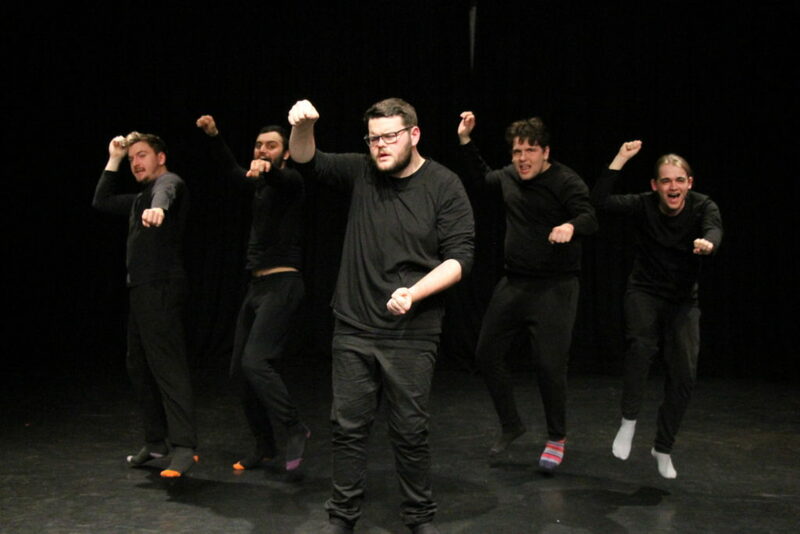 Their ability to devise this Pythonesque physical comedy from the loose plot of a children’s book suggests some promising future work from the troupe.